Social media is based around the idea of sharing (online) conversation and one of the most interesting recent developments is the way that celebrities are using social media to engage with their fan base. Dave Gorman (comedian and long time web publisher) on the other hand has been forced to create an official Dave Gorman Facebook Fan Page to try to stamp out the activities of a Dave Gorman interloper. 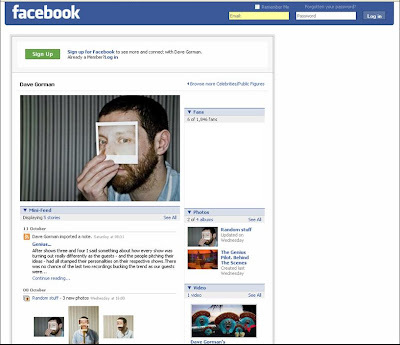 After steadfastly refusing to create a MySpace page (because 'it's ugly and lol appears to be a word there'), Dave Gorman has used his blog to explain the rationale behind the creation of a Dave Gorman Facebook Fan Page and hopes that this will prevent people assuming his identity in the future. Social media is therefore offering new and innovative ways for celebrities to engage their fans, but they need to ensure that others are not assuming their identities. Stephen Fry 'proved' it was the real Stephen Fry on Twitter by linking to his official website from Twitter and from his official website back to Twitter again. John Cleese is clearly the John Cleese on the Seesmic video and Dave Gorman links to and from a range of his official web assets, whilst using his blog to explain the reasoning behind it. This is a nice way to maintain a dialogue with fans and feels more personal than a corporate Fan Page / profile that shows no sign of ever having dialogue outside of the initial creation phase. I would love to see micro-blogging and lifestreaming become a trend that is embraced across the entertainment industry, giving real time information from sets, shoots and exotic locations. This could bring a new edge to traditional broadcasting and be particularly appealing for younger audiences - Simon Cowell Twittering during performances, Jeremy Clarkson on Jaiku........ the possibilities are endless and should definitely be explored! 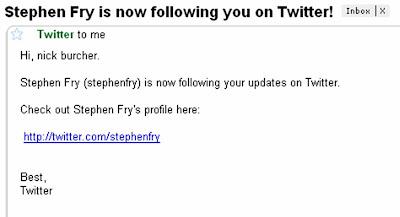 Do you think it is actually Stephen Fry, or is it We are Social promoting Stephen Fry in America (21.00 on Sunday)? Still not sure how I feel about it all. Another sign of our celebrity-obsessed nature?